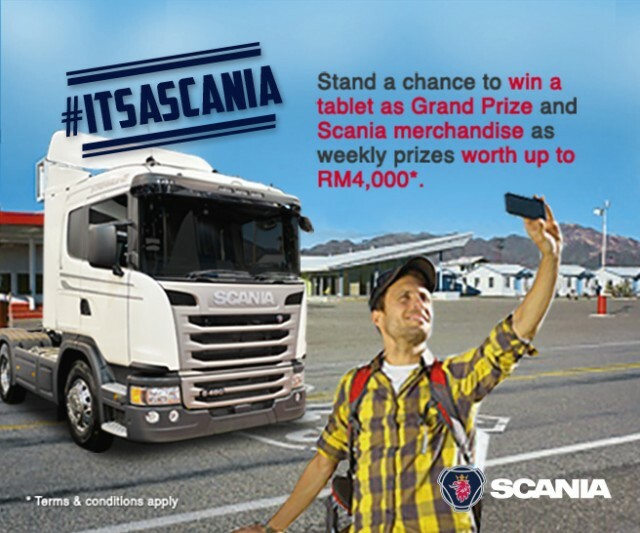 If you love taking selfies, here’s your chance to also win some great prizes in Scania Malaysia’s ‘ITSASCANIA’ Facebook contest and win weekly prizes of Scania merchandise and a Grand Prize of a tablet worth up to RM4,000. 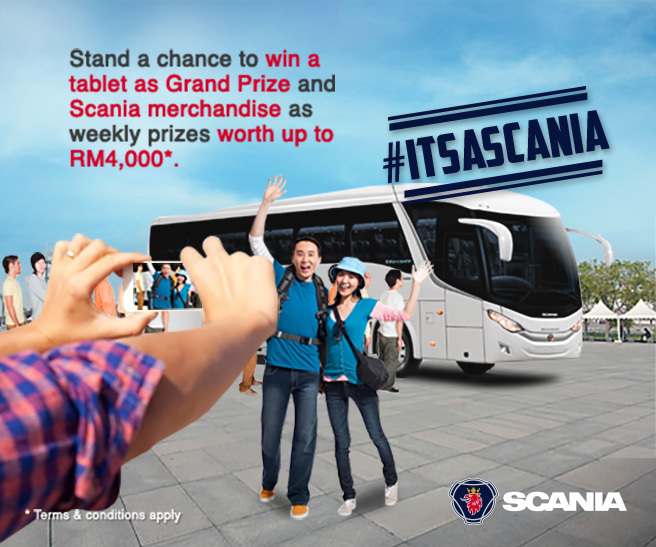 The contest that runs till 31 July, 2016 is great for passengers of bus and coaches, operators of bus, coaches and trucks, people who just love truck and bus spotting and especially those who love and appreciate the Scania brand. 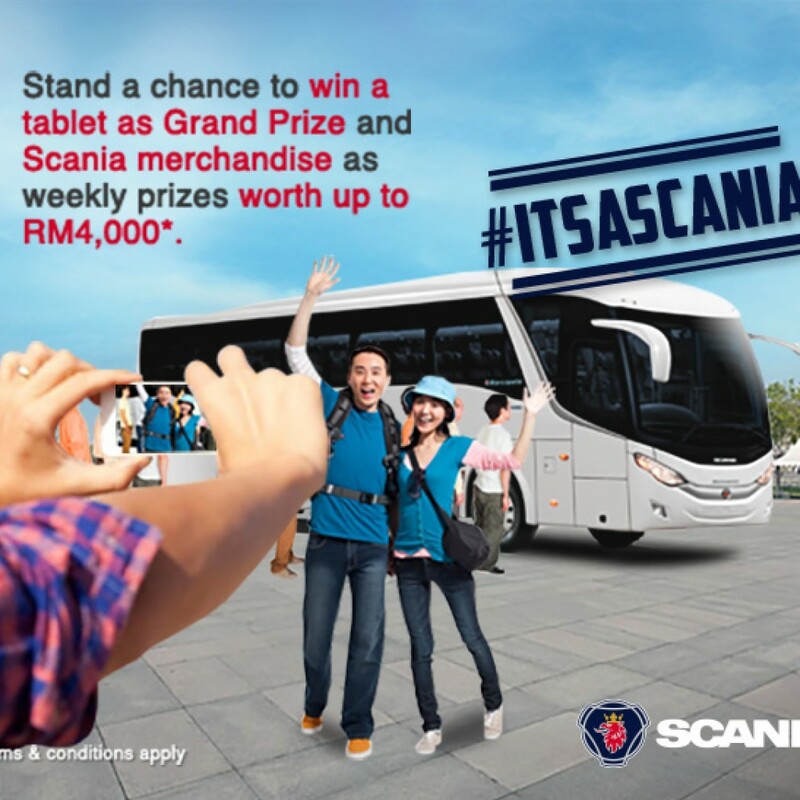 “We know that many people love taking pictures of trucks and buses we decided to create a platform for their passion and creativity, especially when so many people will be on the road this festive season, so please make good use of those selfies as we are looking forward to seeing some really interesting pictures of our vehicles at work and people having some fun,” said Ian Tan, Marketing and Communication Manager of Scania Southeast Asia. DHL Freight, one of the leading suppliers of road transport in Europe, is now further expanding its multimodal network and linking Asian overland and intermodal transportation operations with Europe and North Africa. This was announced by DHL at a joint event with Duisburger Hafen AG (duisport) at the logport site in Duisburg-Rheinhausen. DHL is further expanding its offering through the Duisburg hub with the rail transport service for groupage transport. Of particular interest to companies that can’t necessarily fill a full container on their own, the logistics supplier is also offering the option of consolidating shipments at the DHL Freight Terminal Duisburg. 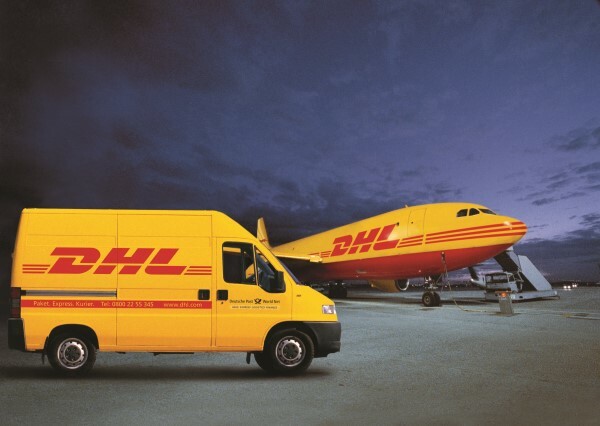 DHL customers thus have the opportunity to design intercontinental supply chains in an uncomplicated fashion and can additionally leverage the time and cost advantages of rail transportation compared with sea or air freight alternatives. Here, customers benefit from the advantageous geographical location of Duisburg, which results in particular from its close proximity to the European economic regions, outstanding logistic connections and excellent infrastructure. “Use of rail networks as a transport route between Asia and Europe has proven to be a highly effective solution at DHL and is very well received by our customers as a genuine alternative. In this connection, Duisburg plays a key role as a transport hub. Shorter routes to customers and excellent intermodal connections provide many opportunities for faster delivery and the leveraging of cost advantages. We therefore intend to consistently expand this segment. Through our new LCL products in the DHL Railconnect segment, we can leverage the strengths of our overland transport networks to the great benefit of our customers,” says Amadou Diallo, CEO DHL Freight. “And we can do so all the way to North Africa. We already have customers whose commodity flows can thus be processed from China via Europe to Tunisia through the multimodal combination of road, rail and short-sea,” he adds. Since 2013, DHL has been steadily expanding its multimodal network between China, Russia and Europe, and has enabled connections to the most important industrial bases in Europe and Asia through its rail links and access to ports in Antwerp, Rotterdam and Amsterdam. As a result of this expansion, DHL customers can take advantage of fixed departures each week between the Rhine/Ruhr Duisburg economic region and the business centers in the coastal region of China (Shanghai to Shenzhen). For customers with full truck loads or containers, DHL additionally offers a link to the intermodal connections within Europe in cooperation with Duisburger Hafen AG. The outstanding intermodal connections to and from southern, western and northern Europe not only enable environmentally friendly onward transportation but also ensure that Duisburg need not be the final rail destination. The logistics infrastructure thus affords the opportunity to process customs clearance to Europe, access a national and international pallet network and offer complete cargo transport via road, intermodally or via container trucking. The multimodal product portfolio also includes DHL’s dense road network in Europe, including multimodal hubs in Hamburg, Warsaw and Małaszewicze on the Polish/Belarusian border in which unit goods, partial or full truck loads can be directly transferred from the road to all existing rail connections. The Małaszewicze site, which DHL is consistently expanding as a gateway to and from Asia, plays a special role in this connection due to its strategically important geographic location. The expansion of the network together with a comprehensive presence in Asia allows DHL to cover the entire transport chain. By expanding the overland route via rail, DHL is creating essential value for customers through cost and time advantages. 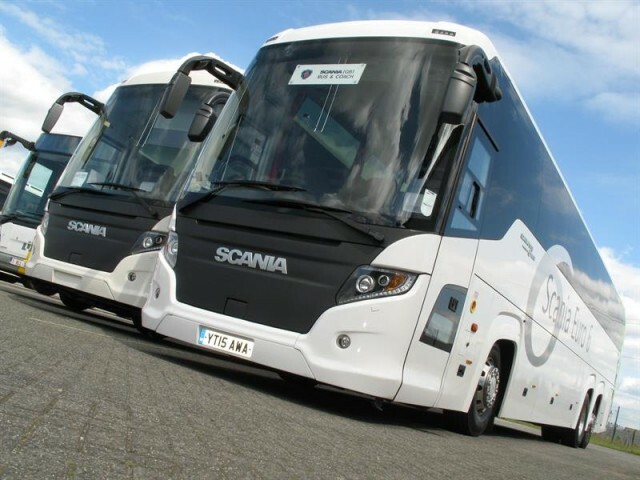 Scania has supplied Bullocks Coaches in Cheadle with two K 360 IB Scania Irizar i6 coaches. 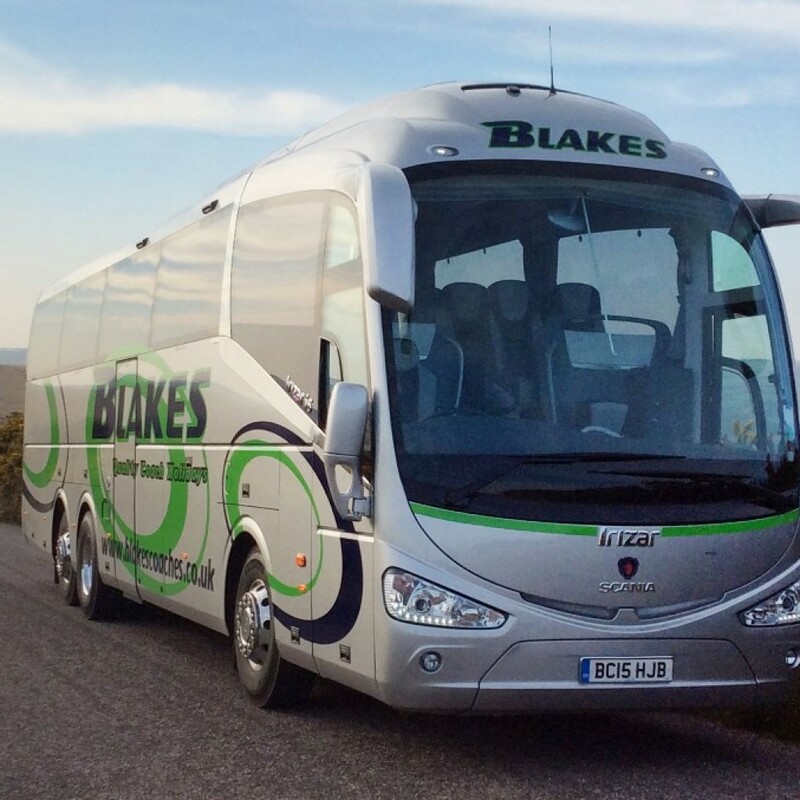 The 53-seater vehicles have leather headrests, three-point seatbelts, centre washroom, Bosch professional line AV systems and kerb lighting systems. Scania also delivered to Kent last week. 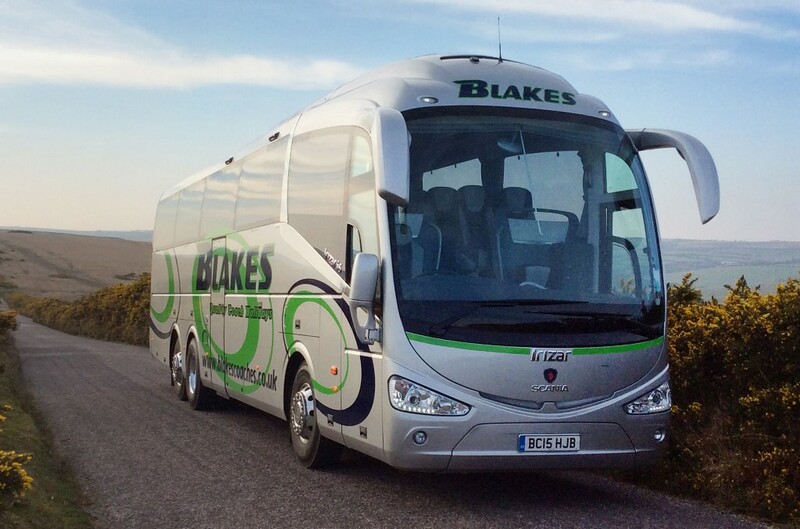 Bayliss Executive Travel has taken delivery of its first new Scania coach, one of three to be delivered this year. The 12.1m-long vehicle has Scania Touring HD bodywork fitted to Scania’s Euro 6 K 360 IB4x2 chassis. 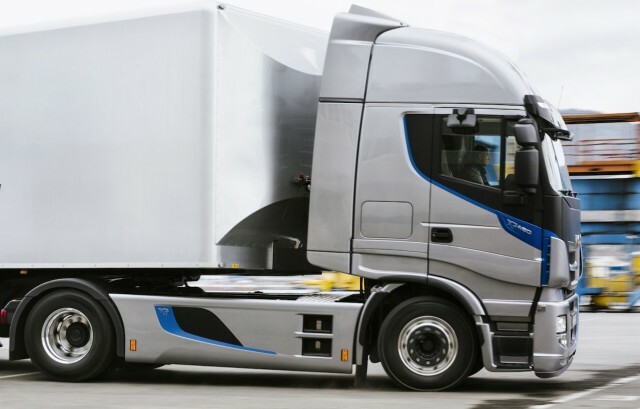 The move towards natural gas being used as a viable alternative to diesel in road haulage have seen a boost this week, with the European launch of the world’s first long haul truck powered entirely by the fuel. The Iveco Stralis NP can run on compressed or liquid natural gas, and unlike other trucks powered by non-diesel fuels, it has a maximum range of 1,500km (932 miles), while maintaining the power rating, comfort and latest transmission technology found across the HGV sector. Natural gas is seen as one of the most viable ways forward for non-diesel fuelled heavy and large goods vehicles, due to its similarities in performance to heavy oil and significantly reduced particle emissions. In the USA, California’s Energy Commission are keen exponents of it, leading to CNG vehicles being widely introduced in a variety of commercial and municipal applications, from light-duty trucks and taxis, to medium-duty delivery vans and postal vehicles, and heavy-duty vehicles like buses, street sweepers, refuse trucks and school buses. However, these are primarily urban uses, as poor fuel consumption on CNG has traditionally limited vehicle range. Yet alongside its fuel range, the Stralis NP delivers 400hp and 1,700 Nm torque, equal to its diesel equivalent, and comes with a 12-speed automated gearbox. It’s the first full-size truck to make natural gas a viable long-haul solution, with the flexibility to also enter urban centres where there are increasingly stringent rules around noise and emissions, both of which are significantly lower than its traditionally powered counterpart. car2go, the car-sharing provider which is part of the Daimler Group, will be opening its 31st international location in Brussels in October 2016. The world’s largest free-floating car-sharer starts up business with 300 vehicles in an area covering around 50 km² in the city of Brussels. As usual, car2go will be using almost exclusively smart fortwo vehicles, which are particularly suitable for use in cities, in the Belgian metropolis. The 250 smart fortwo vehicles will be supplemented in Brussels with a further 50 Mercedes-Benz A Class vehicles. After Madrid (November 2015) and Chongqing/China (April 2016), Brussels will, in October, be the third international location opened by car2go within less than a year. “We are consequently implementing the car2go growth strategy and underlining our world-wide market leadership in free-floating car-sharing”, says Roland Keppler, CEO of car2go. “The increasing usage of car2go clearly shows a growing demand for spontaneous mobility around the globe.” Currently, around 1.9 million customers are registered with car2go making use every 1.5 seconds of one of the 14,000 car2go vehicles in the global fleet. The car2go mobility experts anticipate that the car2go service in Brussels will lead to a medium-term improvement to the strained inner city traffic situation. After all, the free-floating car-sharing concept from car2go has proven over the last few years to be a real alternative to owning a vehicle and a valuable complement to local public transport in 15 other European metropolises. 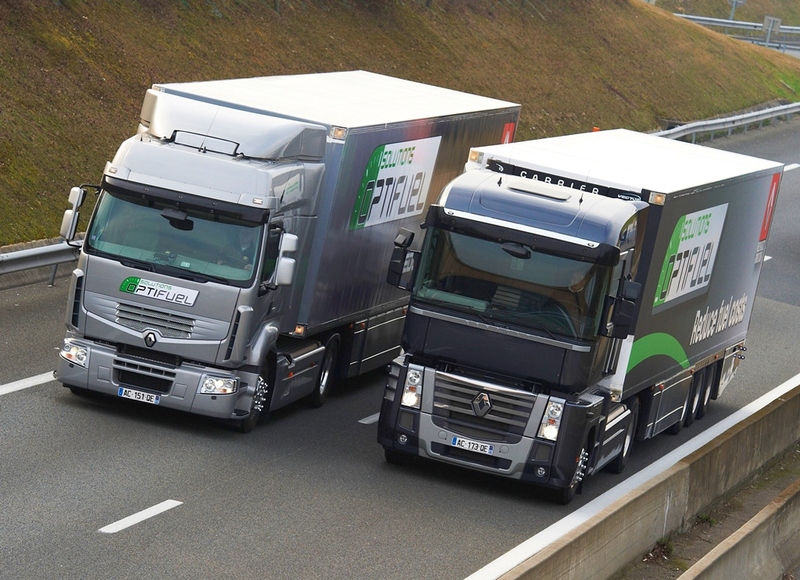 ecoRenault Trucks is extending its Optifleet onboard telematics solution with a new functionality to assist long haul drivers with their eco-driving. It gives customers the possibility of monitoring and individually assessing their drivers’ performance by drawing on Renault Trucks’ 20 years’ experience in economical driving. A vehicle’s fuel consumption results from a driving behaviour pattern as well as a number of parameters which are beyond the driver’s control. For example, the load, the route and traffic conditions. As a consequence, Renault Trucks has now developed a new tool that assesses driving style based on a number of objective criteria. Incorporated into Optifleet, the Renault Trucks onboard telematics solution and its Check module, it enables fleet managers to track and analyse their drivers’ performance more accurately, thereby lowering their cost of use. Thanks to a highly visual interface, the Fleet Manager can easily identify specific Driver development opportunities. These can easily be discussed in an objective way with the individual drivers and dove-tailed into any potential future training needs. 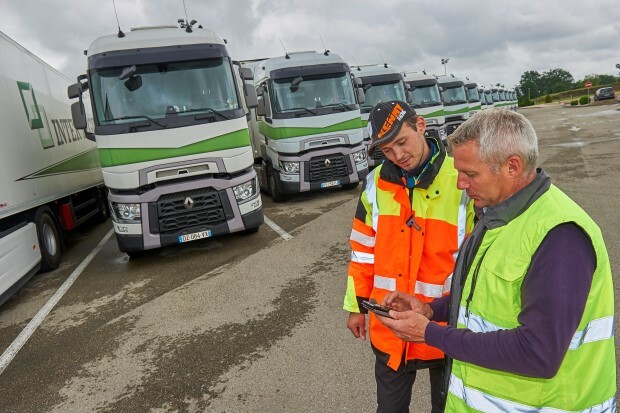 For example, the French company Inter-Légumes – a Renault Trucks customer that trialled the concept – has been able to test this new functionality over a period of several months on the 55 Renault Trucks Range T vehicles in its fleet. The reports indicate drivers’ performance via a comprehensive rating, a colour code (green, orange or red), a general classification and the trend over time. Fleet managers can download weekly or monthly .PDF reports or consult them on their mobile phones. They are based on an algorithm specially developed by Renault Trucks on the basis of its 20 years’ experience in economic driving. The classification criteria of this algorithm do not therefore focus on actual consumption as such, but on items that drivers can control, irrespective of their load, route profile or traffic conditions. This enables all fleets to obtain ratings for each driver solely based on driving performance. This new function is included in the ‘Check’ module at no additional cost for every Optifleet customer and, for hauliers who already use Optifleet, this update is free and will be automatically displayed on their usual portal. With this new Optifleet upgrade, Renault Trucks is further enhancing its solutions designed to enable customers to reduce their fleets’ fuel consumption and help drivers adopt even more rational driving habits. Thanks to its ease of use and highly comprehensive reports, Optifleet can easily be adopted by hauliers wishing to improve their monitoring capability and reduce consumption. 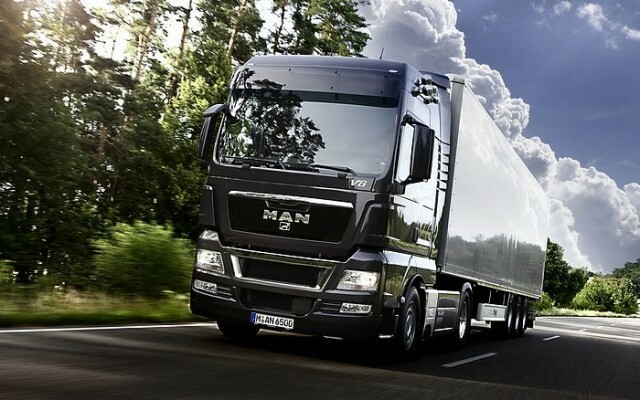 It will also allow the most experienced haulage firms in this field to become even more responsive and efficient. 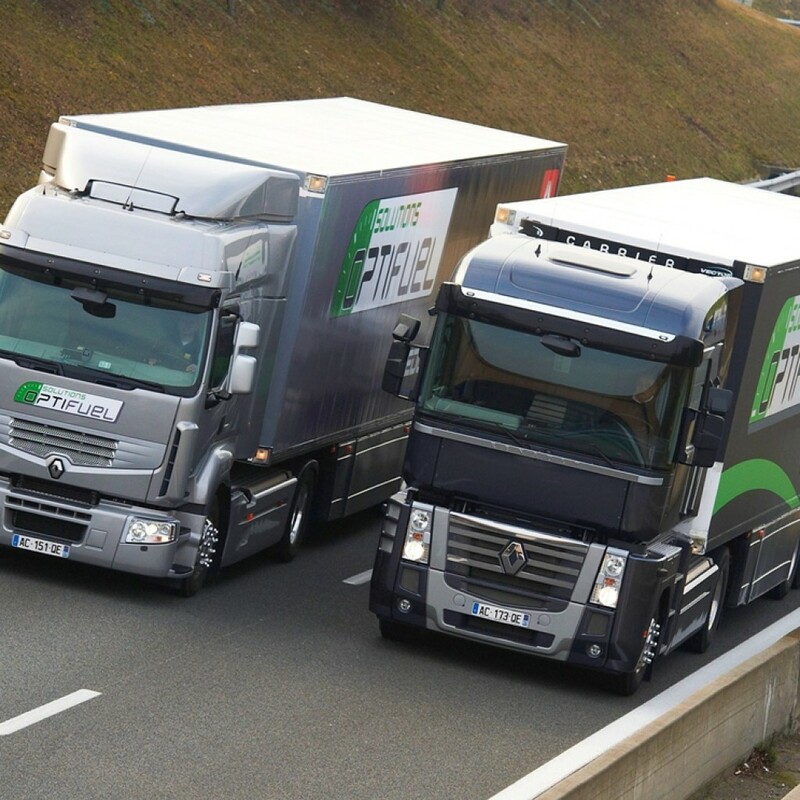 Renault Trucks is extending its Optifleet onboard IT solution with a new functionality to assist long haul drivers with their eco-driving. 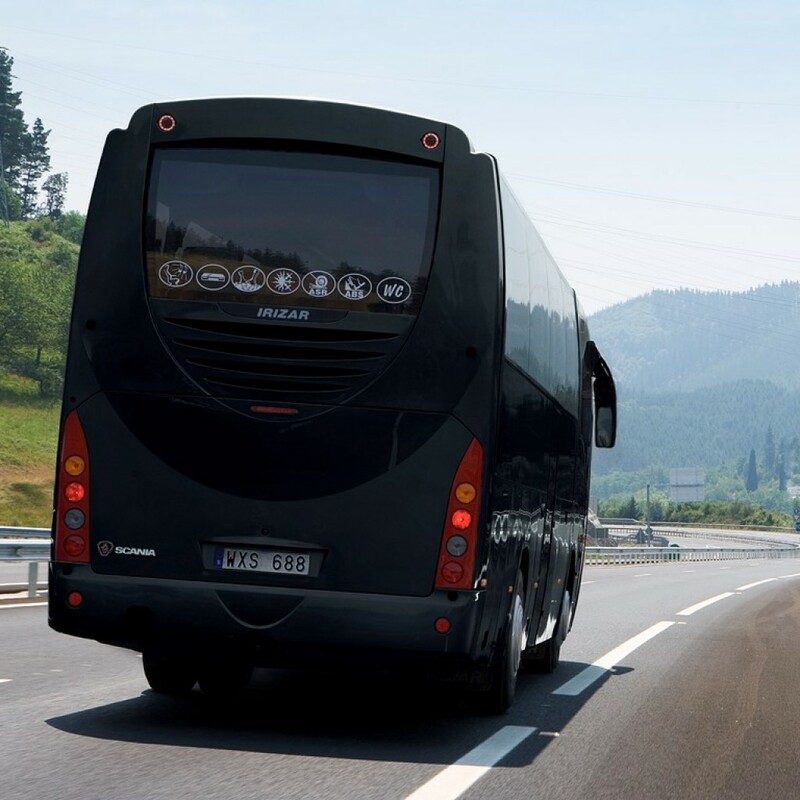 It gives them the possibility of monitoring and individually assessing their driving performance together with optimal use of their vehicle, via an algorithm based on Renault Trucks’ 20 years’ experience in economical driving. A vehicle’s fuel consumption results from a driving behavior pattern as well as a number of parameters which are beyond the driver’s control. For example, the load, the route and traffic conditions. Renault Trucks has therefore developed a new tool that assesses driving style based on a number of objective criteria. Incorporated into Optifleet, the Renault Trucks onboard IT solution and its Check module, it enables fleet managers to track and analyse their drivers’ performance more accurately, thereby lowering their cost of use. Thanks to a highly visual interface, they can then discuss objective criteria with them and swiftly offer training in economic driving to those who need it. 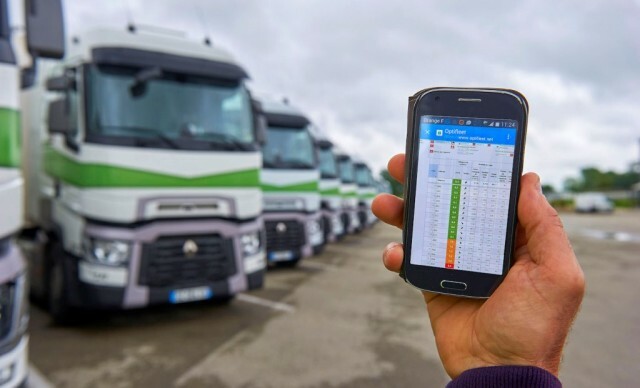 The French company Inter-Légumes, a Renault Trucks pilot client, has been able to test this new functionality over a period of several months on the 55 Renault Trucks T vehicles in its fleet. The reports indicate drivers’ performance via a comprehensive rating, a colour code (green, orange or red), a general classification and the trend over time. Fleet managers can download these reports in PDF format weekly or monthly and consult them at any time on their Smartphones. - the length of time the engine is allowed to idle. Furthermore, abusive use of the power mode or too much over-revving when the Optidriver automated manual gearbox is used in manual mode will penalise the final rating. This new function is included in the Check module at no additional cost for every new activation of Optifleet. For hauliers who already use the on-board IT solution, this update is free and automatic. It will be displayed on their usual portal. With this new Optifleet upgrade, Renault Trucks is further enhancing its solutions designed to enable clients to reduce their fleets’ fuel consumption and help drivers adopt even more rational driving habits. Thanks to its ease of use and highly comprehensive reports, Optifleet can easily be adopted by hauliers wishing to improve their monitoring capability and reduce consumption. It will also allow the most experienced haulage firms in this field to become even more responsive and efficient. 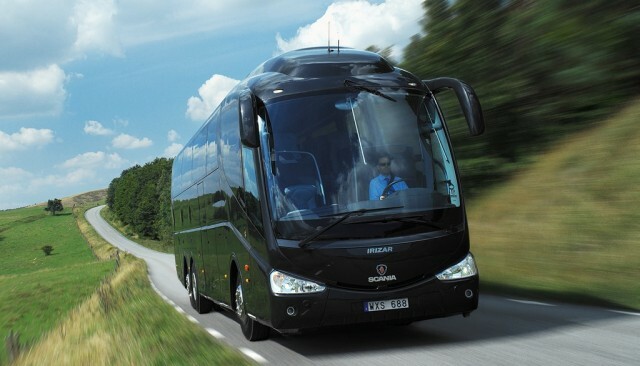 The new Scania Irizar i8 Coach is available in 2 lengths; 13.22m and 14.07m. 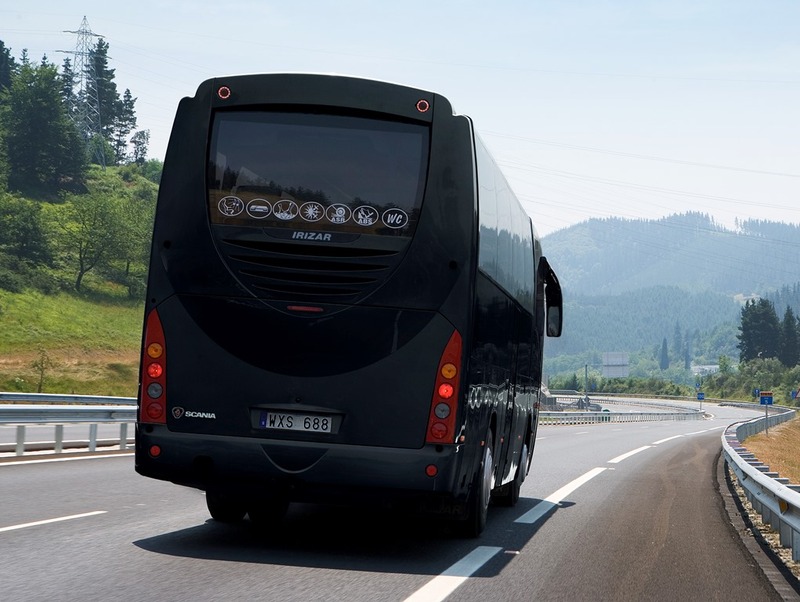 Stylish and fuel efficient, the Scania Irizar i8 boasts an attractive modern design inside and outside the vehicle. The attractive, V-shaped stainless trim stands out at the front, framed by new stylish, full-LED headlights. The revolutionary windscreen style integrates with the LED lights, translating into a clean, futuristic look. Michelin and Iveco have announced that the New Iveco Stralis XP heavy truck will fit the next generation of Michelin X® LINE™ Energy™ tyres as original equipment. The new X® LINE™ Energy™ range is the first tyre range to receive an “AAA” rating for rolling resistance under EU tyre labelling rules. 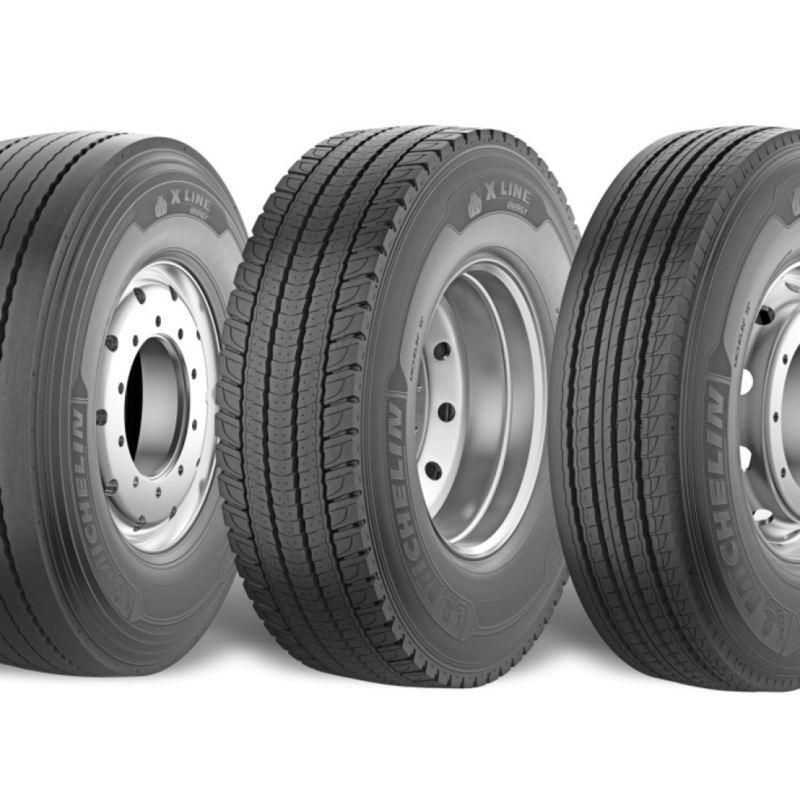 With more than 200,000 tyres sold since January 2013, the Michelin X® LINE™ Energy™ range has repeatedly proven its ability to deliver meaningful fuel savings for long-haul road transport and logistics providers. 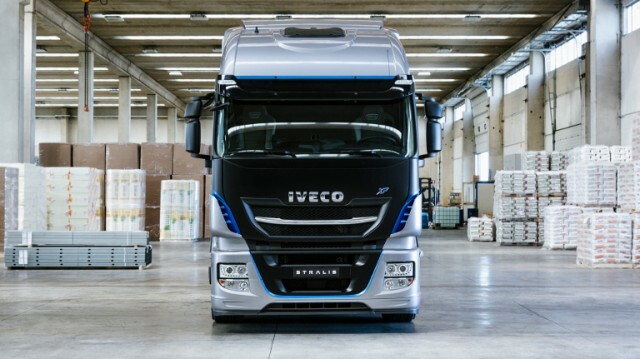 Now, Michelin is taking this ability to a whole new level by fitting – together with Iveco – its first drive tyre to achieve an “A” rating for rolling resistance under EU tyre labelling rules – alongside a steer tyre also rated “A” for rolling resistance. 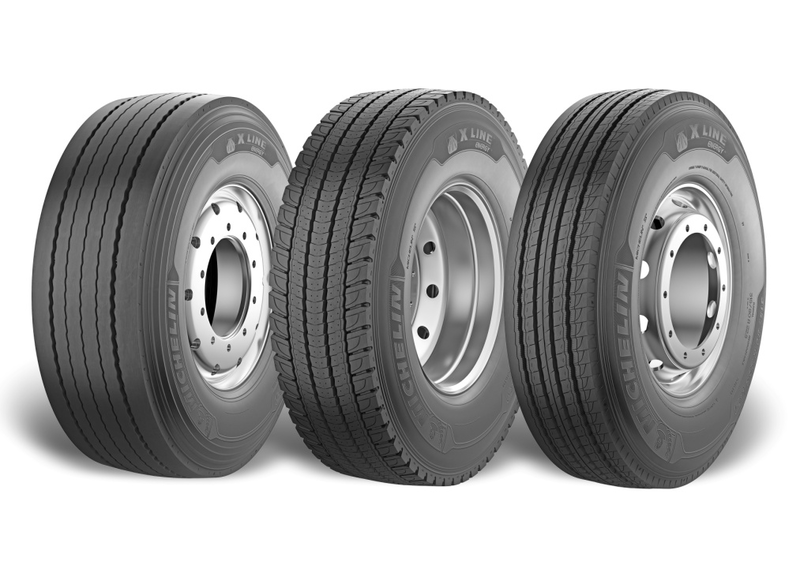 The new tyres extend a range which also features a trailer tyre rated “A”. As a result, Iveco customers can opt for the market’s first heavy truck tyre range to earn an “A” rating for rolling resistance on every axle. 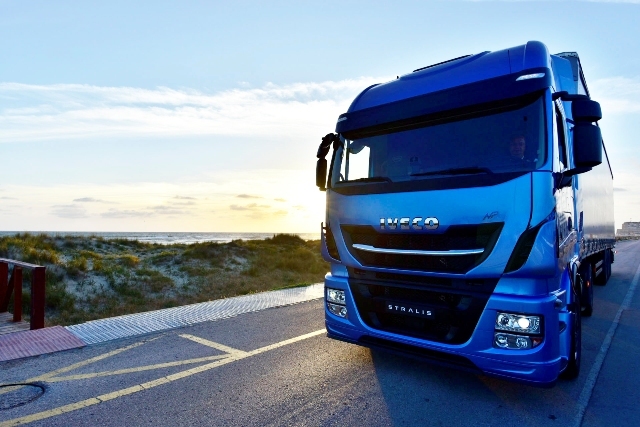 Iveco is launching the New Stralis, with a completely redesigned driveline and energy-saving features to guarantee a lower total cost of ownership (TCO) and reduced CO ₂ emissions. 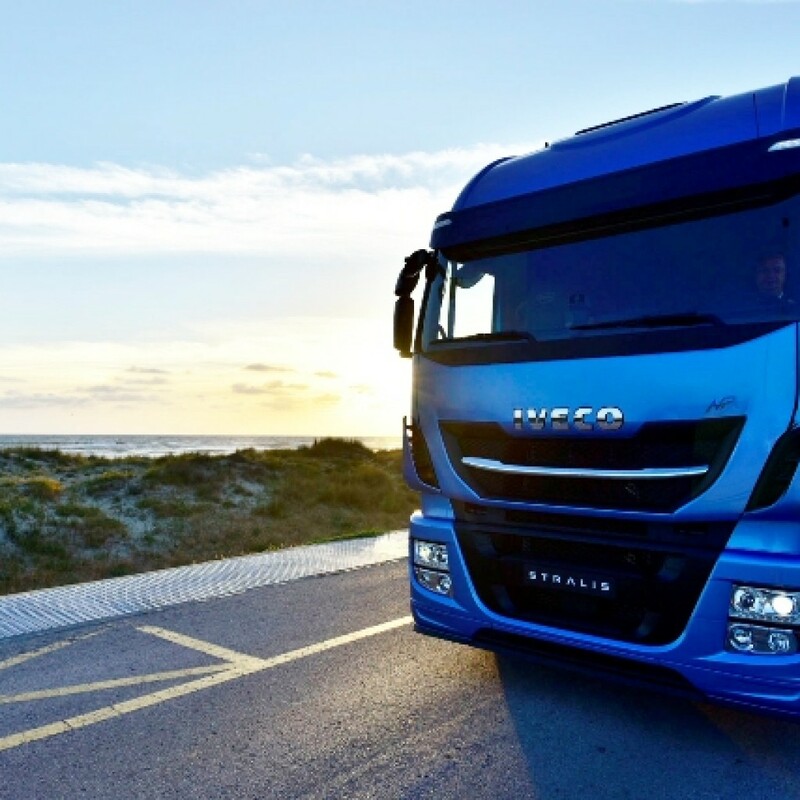 To highlight the outstanding economy and environmental performance of the new truck series, Iveco named it the “TCO ₂ Champion”. The new Michelin X® LINE™ Energy™ tyres will be specified for the New Stralis as standard, initially on the XP model, to ensure customers enjoy the full environmental benefits of the new vehicle. Compared with the current Michelin X® LINE™ Energy™ tyre range, which is rated “BBA” for rolling resistance, the new fitments will help save operators up to one litre of fuel per 100km driven, thereby avoiding the emission of 2.66 kg of CO ₂over the same distance.